The first entirely evidence-based guide revealing the truth about gluten. 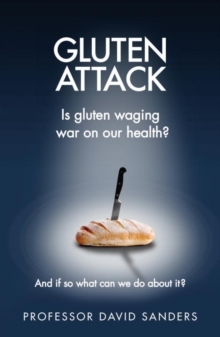 Gluten is regularly lambasted in the press, demonised by wellbeing experts and banned from more diets every day. But do we know why? Where does the hype end and science begin? And will bread forever be off the menu?Cutting through the sensationalism, myths and confusion surrounding all things gluten, Professor David Sanders is here to bring us the very latest evidence and groundbreaking research findings from his very personal journey into the heartland of Gluten. Including: * Specific advice tailored to suit individual needs, from coeliac to wheat-sensitive and FODMAP* A comprehensive look at how exactly gluten affects the body* Delicious gluten-free recipesThis book will help to advise you and empower you, both in terms of understanding the evidence and providing guidance about how best to look after yourself - whether gluten is for you or not.